Uli’s first flight, a late-night joy ride with his brother, changes their lives forever when the engine stops and the boys crash land, with “Texas to the right and Mexico to the left.” Before the accident, Uli juggled his status as both an undocumented immigrant and a high school track star in Harlingen, Texas, desperately hoping to avoid being deported like his father. His mother Araceli spent her time waiting for her husband. His older brother Cuauhtémoc, a former high-school track star turned drop-out, learned to fly a crop duster, spraying pesticide over their home in the citrus grove. After the crash, Cuauhtémoc wakes up bound and gagged, wondering where he is. Uli comes to in a hospital, praying that it’s on the American side of the border. And their mother finds herself waiting for her sons as well as her missing husband. Araceli knows that she has to go back to the country she left behind in order to find her family. In Mexico, each is forced to navigate the complexities of their past and an unknown world of deprivation and violence. Ruthless drug cartels force Cuauhtémoc to fly drugs. “If a brick goes missing, Cuauhtémoc dies. If a plane goes missing, Cuauhtémoc dies. If Cuauhtémoc goes missing, they find Cuauhtémoc (wherever he’s at) and Cuauhtémoc dies.” If they can’t find him, they will kill his mother. They have photos of her in Matamoros to prove they can enforce the threat. Meanwhile, Uli returns to his family’s home in San Miguel and finds a city virtually abandoned, devastated by battles between soldiers, cartels and militias that vie for control. Vividly portraying the impact of international drug smuggling on the innocent, Peña’s debut novel also probes the loss of talented individuals and the black market machines fed with the people removed and shut out of America. Ultimately, Bang is a riveting tale about ordinary people forced to do dangerous, unimaginable things. 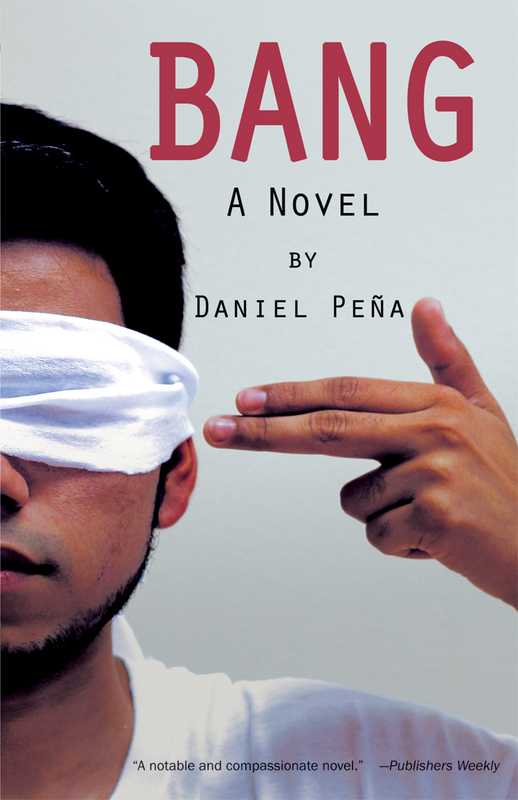 Click here to listen to an interview with Daniel Peña about Bang: A Novel. Click here to read an interview with Daniel Peña in the Chicago Review of Books. Click here to read a review of Bang in the Texas Observer. DANIEL PEÑA, a Pushcart Prize-winning writer, is an assistant professor at the University of Houston-Downtown, where he teaches in the Department of English. Previously he was at the Universidad Nacional Autónoma de México in Mexico City, where he worked as a writer, blogger, book reviewer and journalist. A Cornell University graduate and Fulbright-Garcia Robles scholar, his fiction has been widely published, appearing in such journals as Ploughshares, The Rumpus, Callaloo and the Kenyon Review Online. Bang is his debut novel.